The radiographic demonstration of the major salivary glands by introducing a radiopaque contrast medium into their ductal system. One of the oldest imaging procedures and was first mentioned by Carpy in 1902. In 1925, Barsony and Uslenghi described sialography as a diagnostic tool. 1.Sialographiccannulas – tips ranging from 0.012 – 0.033. 3.5ml / 10 ml syringe. The test is performed in a hospital radiology department or in the health care provider’s office by an X-ray technician. It may also be performed by a dental specialist (an oral and maxillofacial radiologist). You may be given a sedative before the procedure. You will be asked to lie on your back on the X-ray table. An X-ray is taken before the contrast material is injected to ensure that no stones are present to stop the contrast material from entering the ducts. 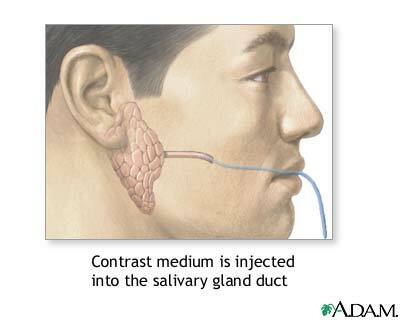 A catheter (a small flexible tube) will be inserted through your mouth and into the duct of the salivary gland. A contrast medium is then injected into the duct so that the duct will show up on the X-ray. X-rays will be taken from a number of positions. • To assess the exposure factors and patient positioning. (about 0.7 ml for the parotid gland, 0.5 ml for the submandibular gland). – Reliance on patients response : under filling or overfilling of the gland. Aqueous contrast media is allowed to flow freely into the gland under the force of gravity until the patient experiences discomfort. • Patients have to lie down during the procedure, so they need to be positioned-in advance for the filling-phase radiographs. A constant flow rate is maintained and the ductal pressure monitored throughout the procedure. • Does not rely on the patient’s responses. The main duct is of even diameter (1-2 mm wide) filled completely. Dots or blobs of contrast medium within the gland , an appearance known as sialectasis caused by the inflammation of the glandular tissue producing saccular dilatation of the acini. – The main duct is usually normal. Widespread dots or blobs of contrast medium within the gland, an appearance known as ‘punctate sialectasis’ or ‘snowstorm’ or ‘branchless fruit laden tree’, or ‘cherry blossom’ appearance. – Retention of the contrast medium during the emptying phase. balloon catheters and small Dormia baskets under fluoroscopic guidance. – An area of under-filling within the gland, due to ductal compression by the tumor. – Ductal displacement – “ball in hand”. This entry was posted in Oral Care, Uncategorized and tagged cherry blossom appearance, contrast medium, parotid gland, sialography, sjogren syndrome, submandibular gland on November 21, 2011 by meifong.